Helloooooo again and Happy Spring! I’ve been away for so long, finishing a cookbook I’ve been working on called Twin Cities Chef’s Table, highlighting Twin Cities chefs, eateries, and our overall food scene, to be published in Fall 2014. It’s been an incredible project to photograph and write, but I’m excited to be back to sharing recipes with you all. 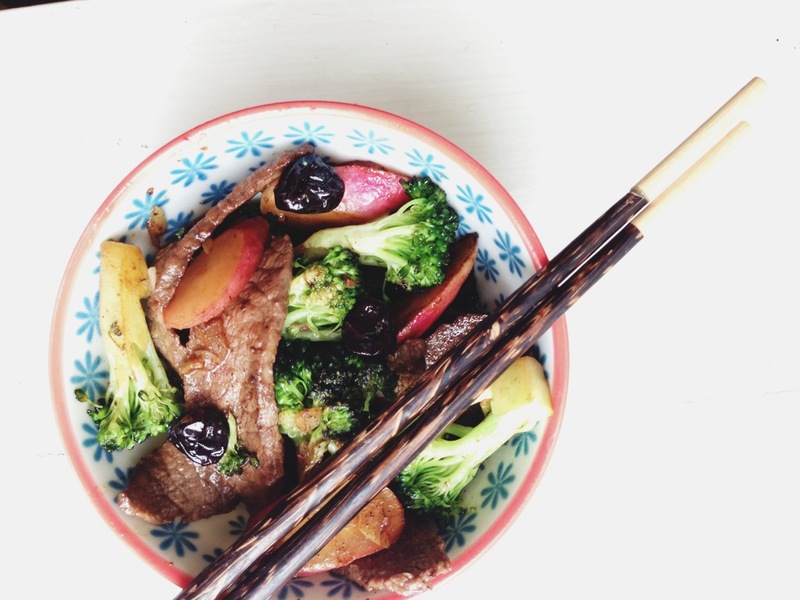 I’m in my third month of the autoimmune protocol allergy elimination diet – see Adventures in Autoimmune Protocol posts for the specifics – and I can report continued improved health and abatement of hypothyroid symptoms and food reactions. 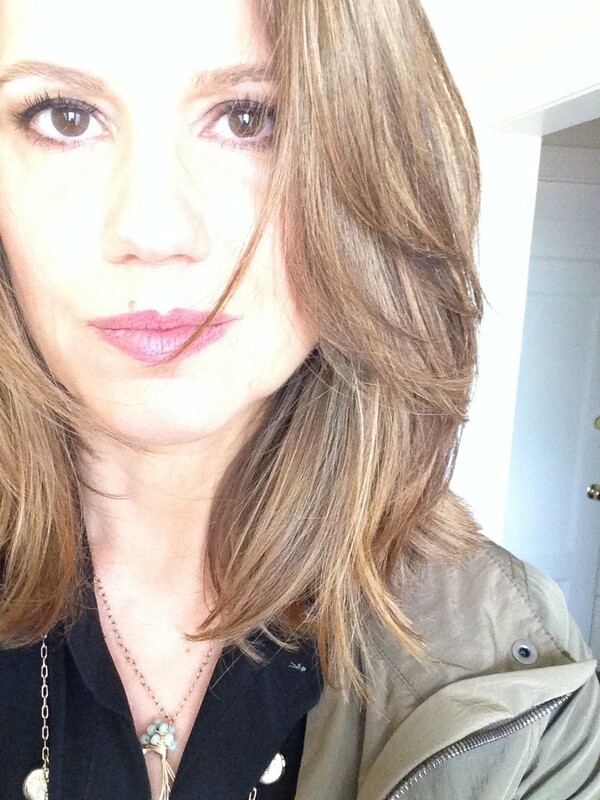 In fact…I feel pretty damn amazing. I seem to have crossed some sort of threshold, into a phase of renewal, which I attribute to a rather kablam confluence of events – intense nutrition/healing, spring, wrapping the book, therapeutic reading/reflection/journaling, the support of amazing friends, plenty of rest (and a magical vacation, next post), as much time outdoors as I can swing, and having my life pointed in the right direction. The best way I can describe it is that I have returned myself to myself. Tralalaaah! It’s a wonderful, long overdue, hard-earned feeling. I’ve said it before and I’ll say it again – I thought the restrictions would be unbearable (no dairy, grains, nuts/seeds, eggs, nightshades, industrial oils, legumes/coffee/chocolate with the goal of reintroducing/testing those foods over the summer to see which specifically were causing my hypothyroid symptoms to roar back), but it hasn’t been unbearable at all and in fact it’s been, um, FUN. It rocks to feel so good, I’ve had a blast cooking, and I am immersed in reading about nutrition, which is exactly how I love to spend my time (recent reads which I highly recommend: The Wahl’s Protocol by Terry Wahl’s, MD; of course The Paleo Approach by Sarah Ballantyne, PhD, which is the protocol I’m following, I refer back to it constantly; Your Personal Paleo Code by Chris Kesser; Deep Nutrition by Catherine Shanahan, MD; The Perfect Health Diet by Paul Jaminet, PhD; It Starts with Food by Melissa and Dallas Hartwig). More on all of those later. I don’t usually post pics of myself, but I like what this one says: my hair health is returning and my face is no longer puffy (hair loss/damage and water retention are both hypothyroid symptoms I am glad to have back under control). One unexpected bonus has been the fantastic interactions I’ve had online around the autoimmune protocol, on Instagram and Facebook in particular. What a marvelous group of people, facing down serious food-related health problems and finding their way back to real, whole food…which means a heck of a lot of cooking. While it’s so easy to feel overwhelmed, it helps me to think about it all as a gift to myself and my loved ones, especially when I’m tired and feeling sorry for myself – my AIP mantra is it is a privilege to cook and eat beautiful food. I understand how woowoo that sounds <insert audible eyeroll>. It’s taken me a long time to feel that way about food and cooking. This blog’s first name was Moderate Epicurean – a reflection of my then thoughts around eating whatever I wanted, in moderation. But my thoughts have evolved and that’s no longer my goal. It turns out that for me at least, healing occurs and moderation takes care of itself when I skip grains, sugar, alcohol, and vegetable oils (and perhaps eggs and/or dairy and/or nuts, I’ll know more when I reintroduce them), and eat a bounty of whole, unprocessed, nutrient-dense food – high-quality meat, loads of vegetables and (smaller amounts of) fruit, and generous amounts of good fat. Putting an autoimmune (or other chronic health) condition in remission is the best outcome of all, of course, but being free from cravings, guilt, weight gain, mood swings, and low energy is a close second – in fact, without those side-effects, actively striving for moderation is unnecessary. Perhaps that’s a source of my unburdened tralalaaah feeling as well, I hadn’t thought of it until right now. I am free from worrying about my weight, eating every few hours, or whether I’ve had one too many cocktails. It would have been nice to figure that out before I was in my 40s (I began my gluten-free, and then grain-free/Paleo journey almost 4 years ago), but hey. There’s hope for the next generation… …as exemplified by 18-year old Joshua Weissman, who through giving up processed/packaged non-food and learning to cook real, fresh, nutrient-dense food, lost 100 pounds and reclaimed his health and vibrancy. 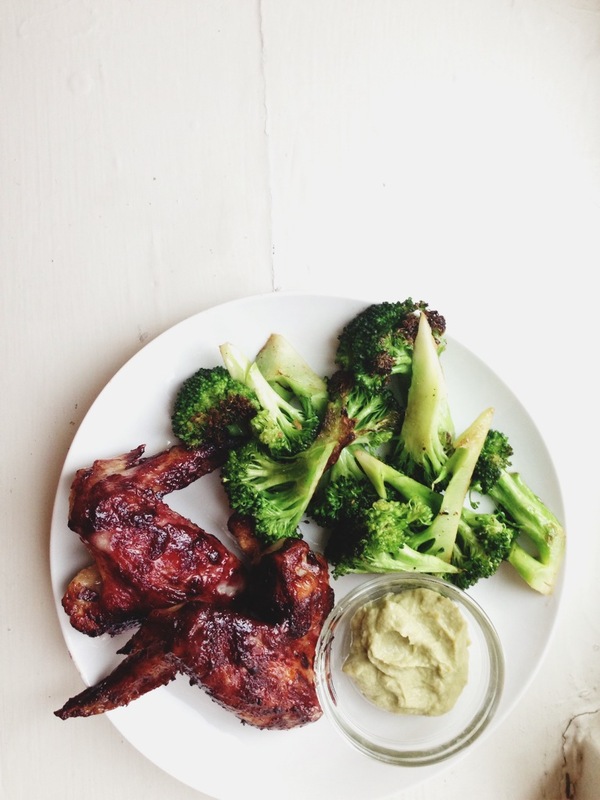 On his journey, Josh has become a crazy-talented food photographer and recipe writer at his beautiful blog, Slim Palate. In addition – this is one very accomplished young man! 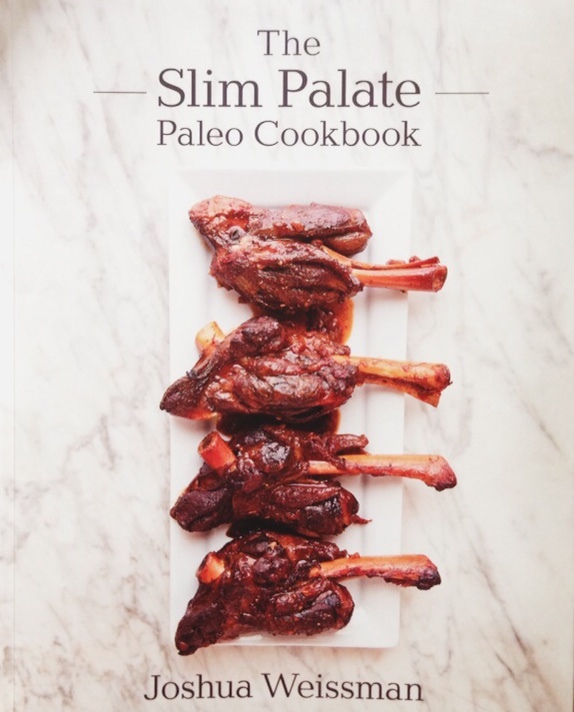 – he recently published the smash hit The Slim Palate Paleo Cookbook, a book rich with delectable, approachable recipes for everyday and special-occasion cooking. Josh has accomplished all of this while finishing his senior year in high school. In honor of all of his accomplishments – and in honor of spring, and fresh food, and good health – I can’t imagine a better way to return to blogging than to give away a copy of his book! Leave a note in comments if you’re interested, I’ll announce a winner here on Fresh Tart in one week, next Tuesday, May 27. The recipe is adapted from Josh’s book. I gave an option for using fresh morels and ramps – ’tis the season, of course – but the dish is gorgeous with dried morels too, which makes it an all-season recipe. As a one-pan dish, it’s a weeknight recipe as well. 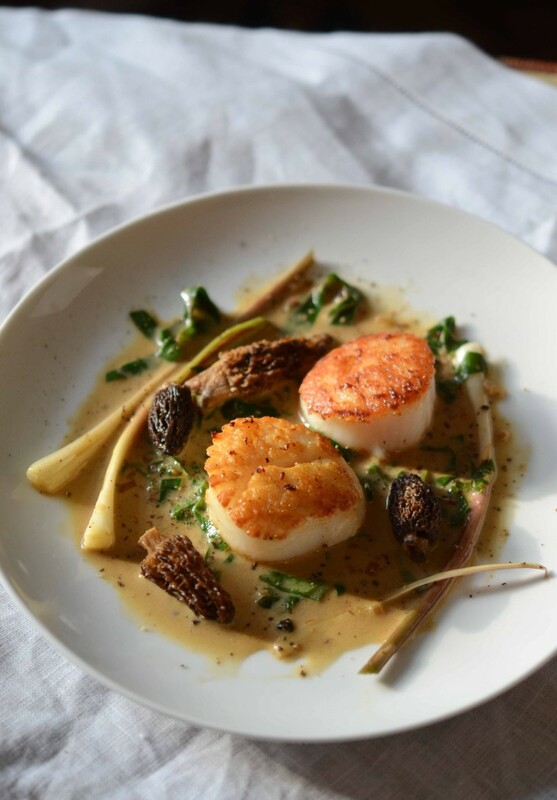 And as scallops with morels and ramps, it’s a party recipe too! Note: In lieu of fresh morels, substitute 1/2 ounce dried morel mushrooms soaked in hot water for 20 minutes. Use the mushroom soaking liquid instead of clam juice. In lieu of ramps, substitute scallions or omit from dish. Using paper towels, pat scallops dry and season with salt. Heat a 12-inch skillet over medium-high heat. Add 1 1/2 tablespoons of oil to the pan and when oil is hot, add scallops to the pan. Sear scallops for 2-3 minutes or until nicely golden brown. Flip scallops and cook for another 1-2 minutes, until just cooked through (do not overcook the scallops or they will be tough). Transfer scallops to a large plate to rest. Turn heat to medium and add remaining 1 1/2 tablespoons oil. Add shallot and cook for 3-4 minutes, until softened, then add morels. Cook for 4-5 minutes, until morels are soft and browning in spots. Add ramps, garlic, and lemon juice to the pan and cook for another 3-4 minutes, until ramp greens are wilted. Add saffron threads, coconut milk, and clam juice to the pan. Bring to a simmer and reduce the sauce until thickened lightly, about 2 minutes. Season to taste with salt (it may not need any if you use clam juice). Divide scallops among 4 plates. 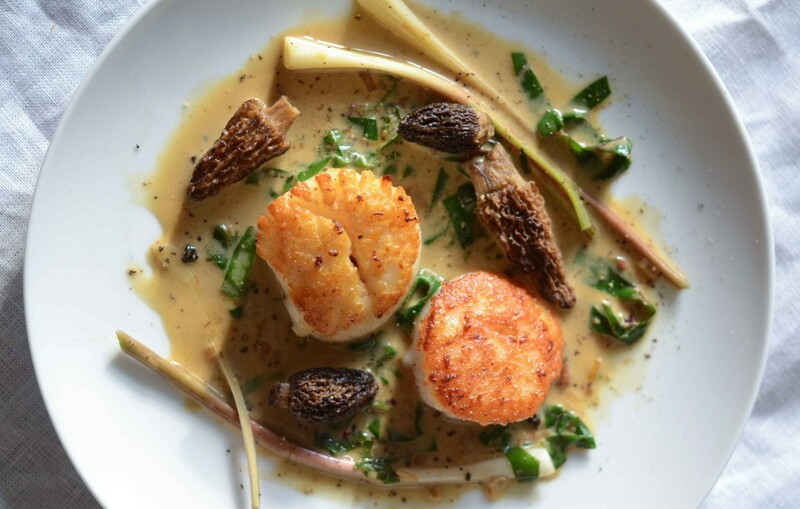 Divide ramps and morels around scallops, then top with pan sauce.